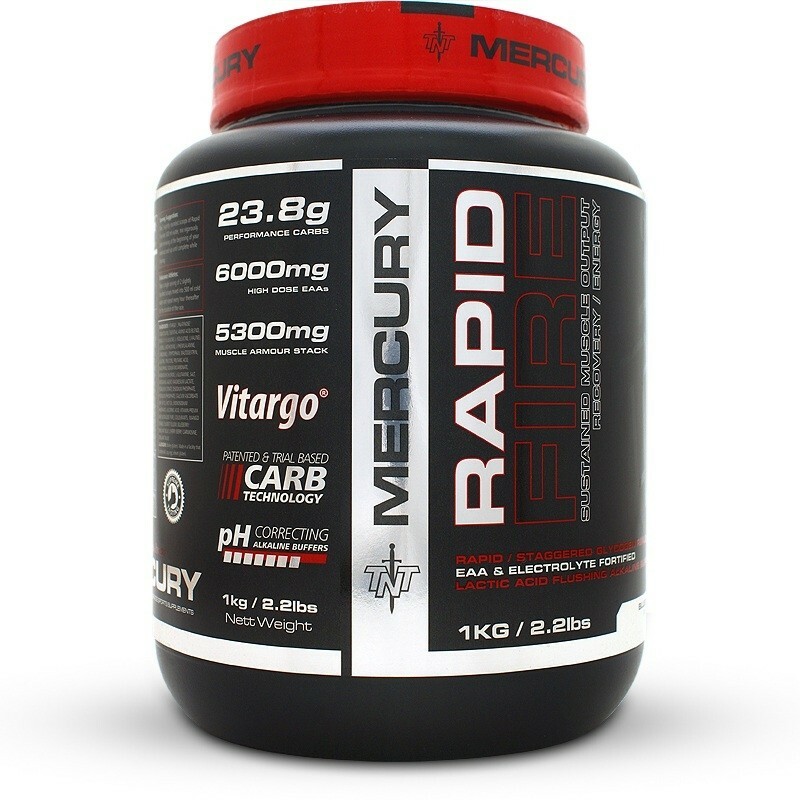 TNT Mercury Rapid Fire is the perfect recovery and endurance supplement for athletes. Once consumed carbohydrates convert into glycogen which is stored in the liver and muscles ready to be used as the body’s primary fuel source. Muscle glycogen levels decrease as strenuous training increases. To maintain effective workout performance an athlete must make sure they have sufficient glycogen stores and replenish them as fast as they can. Formulated with a performance carb blend of Vitargo and Palatinose. After clinical data review, Vitargo claims that it will replenish depleted glycogen stores up to 63% faster than regular carbohydrates. Palatinose is a low-GI smart carb which gives a constant supply of energy without blocking the fat burning process. Fortified with a blend of alkaline buffers to reduce lactic acid build up which may lead to DOMS (Delayed Onset of Muscle Soreness). Essential Amino Acids (EAA) have been added as they are crucial for the body to perform at its best by improving immune response and glycogen synthesis. Sodium, potassium and other electrolytes are included to allow cells to generate energy, proper muscle contraction and move water optimally within the body. TNT Mercury Rapid Fire is a well-designed training performance drink. Using nothing but the best ingredients such as patented Vitargo and Palatinose, TNT have created a supplement that stands out from other products in the category. L-Glycine, L-glutamine, Sodium Bicarbonate, Magnesium Chloride, Magnesium Lactate, Potassium Citrate, Disodium Phosphate, Potassium Phosphate, Calcium Ascorbate (90% Vit C), Monosodium Phosphate. Bcaa 2:1:1 (L-Leucine, L-Isoleucine, L-Valine), L-lysine, L-methionine, L-phenylalanine, L-threonine, L-tryptophan. Made in a facility that handles milk, soy, egg, wheat (gluten). • Mix 2 slightly rounded scoops into 500ml water and mix vigorously. • Start drinking at the beginning of your workout and sip until complete while training. • Endurance Athletes: Take a single serving and repeat every hour thereafter for the duration of the race. This product is a dietary supplement and is not designed to treat or cure any ailments and no claims have been substantiated by the medical control council. Should you suffer from any ailments such as, but not limited to, high blood pressure, high cholesterol, thyroid disorder, depression etc, consult with a physician or dietary expert before embarking on a high calorie diet.